One of the premier holiday getaways on the globe, Puerto Vallarta attracts visitors of all persuasions, including college students on spring break, honeymooning couples, and affluent jet-setters. Puerto Vallarta is ideally situated at the foot of the Sierra Madres on the coast of the spectacular Banderas Bay in the western state of Jalisco, Mexico. Since the sheltered deep water of Banderas Bay connects to the Pacific Ocean, the seaport of Puerto Vallarta welcomes both cruise ships and U.S. Navy vessels. The Mexican Navy docks in the area year 'round. With its amalgamation of majestic mountain panoramas, spectacular coastlines, pristine beaches, jungle waterfalls, verdant forests, and cobblestone boulevards lined with charming stucco buildings of Spanish design, Puerto Vallarta is an unparalleled vacationers' utopia. The amiable and accommodating nature of the Mexican people, as well as the amazing variety of activities and luxurious facilities, make Puerto Vallarta a satisfying destination for even the most persnickety travelers. 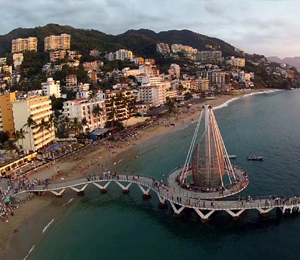 Before becoming a world-class resort mecca, Puerto Vallarta was a quaint little fishing hamlet and port town. Founded on December 12, 1851 by Don Guadalupe Sanchez Torres, its original designation was Pierto Las Penas or the Rocky Port. Originally developed as a port for locally-mined silver, the town was classified as a municipality in 1918 and renamed Puerto Vallarta after former state official Ignacio Vallarta. Hollywood film director John Huston brought world-wide attention to Puerto Vallarta after filming the 1964 critical hit, The Night of the Iguana. The movie's star, Richard Burton, along with his wife, Elizabeth Taylor, drew world-wide press attention to Puerto Vallarta. The resulting publicity brought developers to the area in the early 1970's and vacationing tourists soon followed in droves. John Huston, who owned a villa in Puerto Vallarta, was honored with a monument for his contribution to the resort's rapid expansion. And visitors still flock to Puerto Vallarta for the plethora of outdoor activities. In addition to zipline adventures, there are activities such as hiking, horseback riding, and mountain biking through the Sierra Madre Mountains. If you are interested in the region's historic past, explore the archaeological ruins at Ixtapa. For the water-sports enthusiast, there's scuba diving, reef snorkeling, and top-notch offshore fishing. While on the water, keep your eyes peeled for some amazing aquatic life like the enormous humpback whales, frolicking dolphins, and mammoth eagle rays. Puerto Vallarta is also the perfect destination for relaxation. Sunbathe on the shores of Banderas Bay while enjoying a refreshing margarita. Allow yourself to be pampered in the spa of one of Vallarta's premier resorts. You'll find that this full-service resort town is home to a variety of dining, entertainment, and accommodation options for any budget. And with three hundred and twenty days of sunshine during the year with an average temperature ranging from sixty-eight to eighty-five degrees Fahrenheit, Puerto Vallarta is home to near-perfect weather!